Why Does Triathlon Have Such A Clean Image? It is almost impossible to believe that cycling, track and field, and swimming aren’t rife with doping. A large swath of top cyclists have tested positive for PEDs or admitted doping; track and field had state-sponsored doping programs in Eastern Germany, China, and Russia, along with hundreds of other athletes testing positive for PEDs; swimming has had fewer widespread doping scandals, but dozens of swimmers have tested positive for PEDs, and the doping suspension and reinstatement of Yulia Efimova, and the doping accusations leveled at Katinka Hosszu, were huge stories at the Olympics. 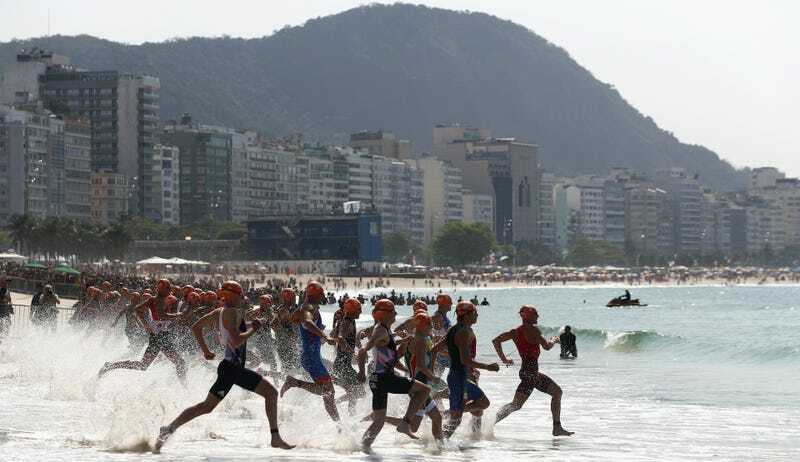 All of which raises the question: Why does the triathlon, an Olympic event since 2000 that combines swimming, cycling, and running, appear to be so clean? A quick search of “triathlon” in mainstream publications like USA Today or the Wall Street Journal returns not a single story, not even a hint, about performance enhancing drugs. The same cannot be said of track, swimming, or cycling, where you don’t have to be an insider to get the impression that many top-level performances are PED-assisted. Those sports have had enough revelations of widespread doping, bribery, and coverups that most breakthrough performances are suspect. But not so triathlon. Why is that? It’s an endurance sport, an Olympic sport, in which international groups of athletes train in sometimes remote locations where out-of-competition testing is difficult and doping would be relatively easy. How did triathlon cultivate this pristine image, and is it warranted? Are triathletes somehow able to resist the pressure to cheat? The short answer, according to top international triathlon coach Joel Filliol is that there is doping in triathlon. The disincentive from within to self-police, to catch and punish dopers is universal across all Olympic sports, and accordingly, many of the debacles that have stained cycling and track and field were uncovered by whistleblowers and journalists, not anti-doping agencies. From the outside, track fans zealously call out cheats on forums like the LetsRun message board, and cheating is vigorously investigated by running-related media outlets. By contrast, fans of triathlon and journalists who cover the sport, Filliol said, don’t seem interested in pursuing doping. The ARD TV revelation of systematic statewide doping in Russia focused largely on track and field, partly because there simply are more track and field athletes, and partly because top officials in track’s governing body, the IAAF, were found to be complicit in both extorting and accepting bribes for covering up positive tests. But Russian triathletes, Filliol said, were involved in that massive scandal too, though that fact wasn’t played up in triathlon-specific media or mainstream outlets. The motivation and independence to catch triathlon dopers may be low, but you would not guess that from the confusing alphabet soup of overlapping anti-doping agencies taking blood and urine samples. For example, U.S. pro triathletes may be tested by USA Triathlon, the U.S. Anti-Doping Agency, the International Triathlon Union, the U.S. Olympic Committee, or the International Olympic Committee. ITU does its own testing of sprint and Olympic distance (1.5K swim, 40K bike, 10K run) events, separate from WADA, USADA or the IOC, with its own budget and testing pool, but doesn’t publish who has been tested, how often, and by whom. Most of the People Of The Anti-Doping Acronyms hailed the Athlete Biological Passport system as their secret weapon in doping control. What they didn’t mention is that it’s prohibitively costly to implement correctly. Filliol recalled a conversation he’d had with a physiologist who estimated an ABP requires maybe 11 tests in a year, almost one a month, to establish a baseline. Testing an athlete a couple of times a year, the physiologist said, does not create a credible baseline. Sport scientist Ross Tucker concedes the more tests, the better to legitimize ABP, but would not hew to a specific number of tests per year. “The more the better, obviously, because that sets a more consistent baseline,” said Tucker. “I don’t know if I’d necessarily say 11 though. If a person is spending time at altitude, and some at sea level, then you need more because you’d want to get a fuller picture for what altitude does to them, establishing the variation in values this causes. Whereas if someone is just at sea level, you could get by on fewer. Ironman Anti-Doping, for example, reported 100 athletes in their ABP program, and 253 ABP tests in 2014. Assuming athletes in the pool are tested with equal frequency, no athlete is tested enough to establish a baseline. ITU has 20 athletes in its ABP pool, who were tested 92 times in 2014, so better, but still probably not enough. According to USADA, six of the 61 triathletes in their testing pool are currently serving doping sanctions, while 475 of the roughly 2,500 athletes in other sports are serving doping suspensions, meaning triathletes are caught doping about half as often as athletes in other sports. And according to a 2014 WADA report, a similar trend of triathletes being caught doping less often than other athletes exists globally. Filliol believes that triathlon’s relatively short history may be working in its favor. Being a “young” Olympic sport, he reasoned, it does not have the damaging baggage from decades of scandals—particularly the 1970s and 1980s—that swimming, track, and cycling are saddled with, and the onus to maintain its unsullied reputation is strong. But strong enough to somehow exempt triathletes, of all athletes, from what seems nearly universal human behavior—the willingness to cheat?